Believe it or not, salwar suit is the most popular Indian ethnic wear. Also, known as Salwar Kameez, it is a quintessential Indian dress for young ladies and women in Himachal Pradesh, Punjab and Haryana but nowadays it’s popular all across the country. The comfort and flexibility of this clothing not only made it a popular wear all across the country, but also made it an integral part of every woman's ethnic couture. Be it spring, autumn or summer, this classic and evergreen piece of clothing never goes out of the trend. A salwar suit comprises of mainly three parts — a tunic top (kameez or shirt), a dupatta (scarf or odhni) and a salwar (like a loose pyjama). In Indian tradition, married women generally wear a dupatta to cover their head and beautifully drawn it over the bosom. The best part of this ethnic wear is that one can do a lot of experiments with an unstitched salwar suit according to their aesthetic tastes. If you are one of those who are looking for beautiful salwar suits for special occasions like weddings, engagement, baby shower or simply for lounging at home, Craftsvilla brings to you a wide collection of gorgeous salwar suits to suit every occasion. 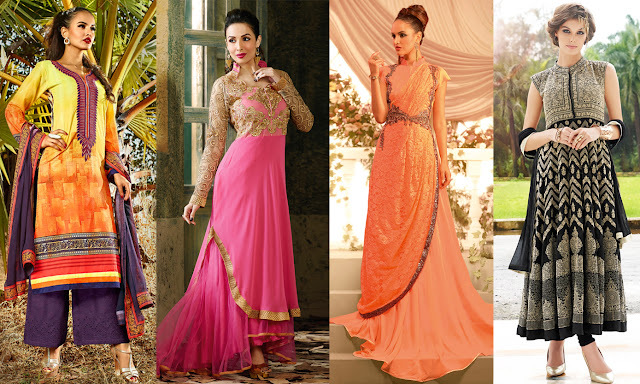 From traditional Punjabi salwar suits to designer Anarkali, you will find all the latest trends only at Craftsvilla. So, get ready to explore their impressive range of Indian traditional attire.